So, long time coming...Charlie's mom came to visit in March for 10 days. She was great. She watched Nate while Charlie and I had to work. They wore each other out. We went to a BBQ of some friends on the Sunday she was here. At the BBQ Charlie got to see Scott Jones and friend of his from Idaho and they were able to play guitar together. They had a dune buggy that Nate loved to sit in and "drive". Grandma helped Nate "ride" the 4 wheeler too. They never actually went for rides on them b/c they were both not working. But as you will see, Nate was in heaven! Grandma and Grandpa Rice (we were sad b/c Grandpa Rice could not come) got Nate a Little Tikes police car and he loves that too. Grandma taught Nate how to "put gas in the car" by putting your finger in the spout and making a sound with your mouth that sounds like running water. We are so glad that Grandma was able to come play with us for a while. Next time try to bring Grandpa too though! 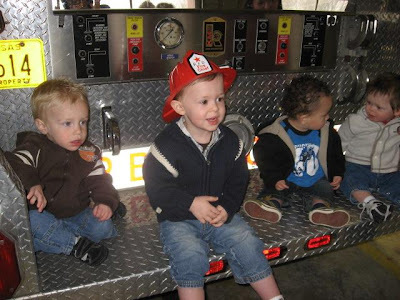 So on Friday Nate got to go to a birthday party for Bennett, a boy from church that turned 2. 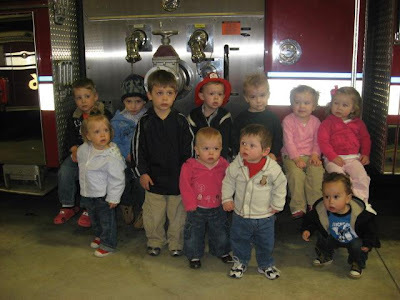 They got to go to a local fire dept. and play on the trucks. The fire dept. said they are the slowest in all of our town. Nate thought it was so neat. I didn't bring my camera because I didn't know about the party until that afternoon and I was already at work. So these pictures are curteousy of Miquilin, Bennett's mom. Nate got to go on top of the fire truck with one of the dad's. (no way was I climbing up there!) He thought that was great too, but I don't have a picture of it darn it! We then went to the church for pizza and Nate ate the whole slice by himself, higglety pigglety! It was a great day for Nate. FYI- I asked how much this certain fire truck cost b/c they were bragging about all the "bells and whistles" on it. They got a great "deal" at just over $650,000! Man those things are expensive! Nate tried to jump off of this part of the truck, giving mommy a heart attack! Charlie and I are doing well also, life is busy and hectic. A couple of weeks ago Linda, Charlie's mom came to visit and we (Nate especially) had a wonderful time. Nate wore grandma out and grandma wore Nate out. When I find my camera cord, I will post some pictures.